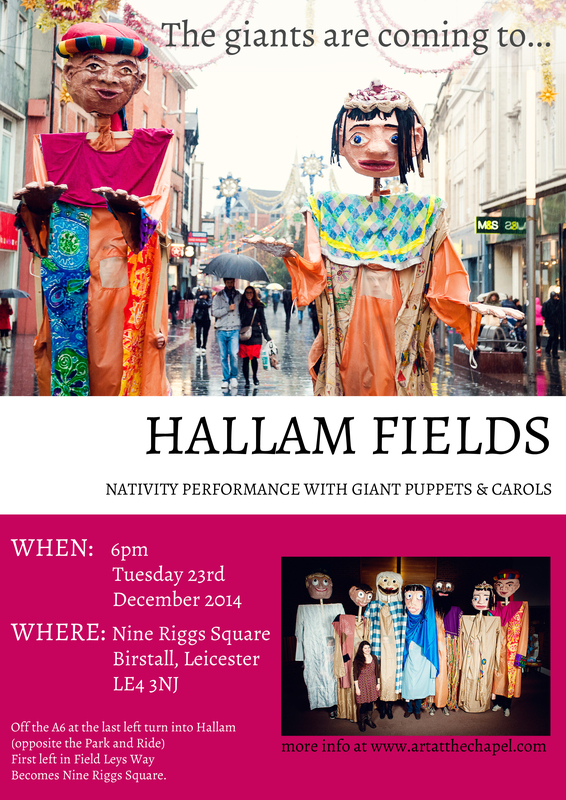 Giant Puppets in Leicester, The Full Story!! 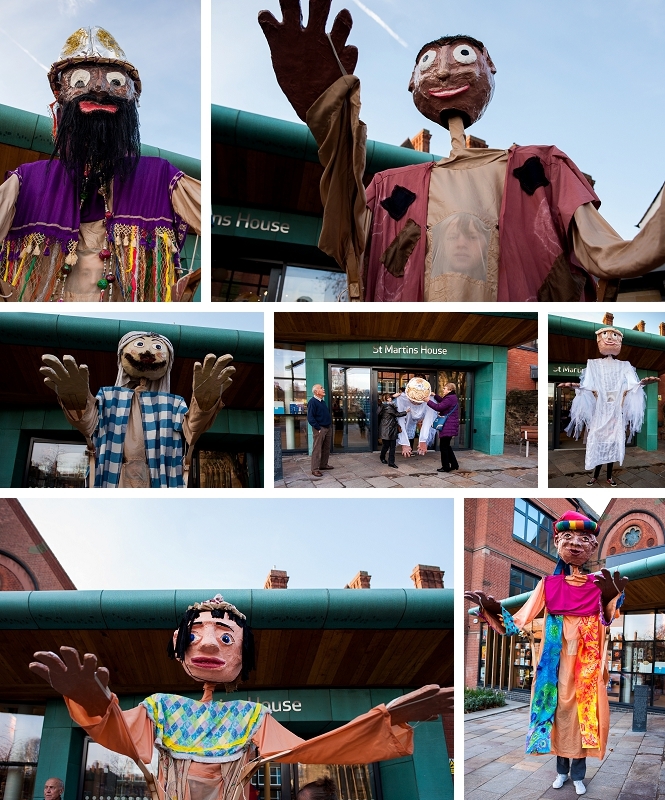 Please click on the following links to watch two fantastic short videos about the puppets! 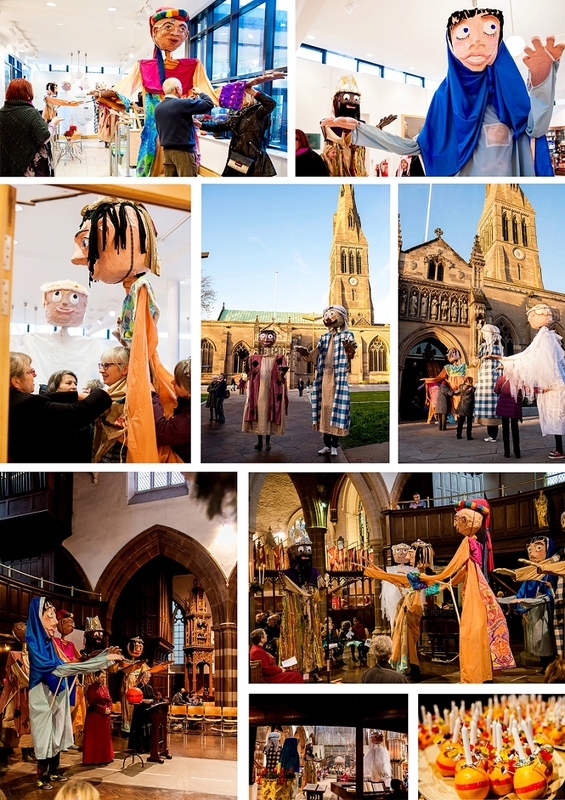 Watching as some very impressive Giant Puppets wandered around the Christian Arts festival ‘Green Belt’ in the summer of 2014 started Rachel Parkinson from Birstall Methodist Church thinking….it would be fantastic if we could have puppets like this in Leicester!!! So the journey began! Rachel asked Art at the Chapel if we would like to be involved and we jumped at the chance! 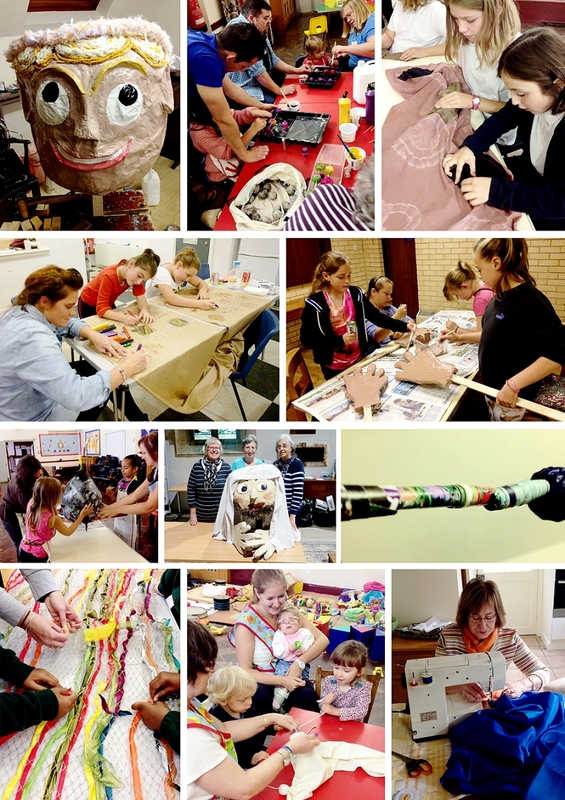 A few weeks later I found myself squeezed into Rachel’s car with a lovely group of people hurtling our way down to Liverpool for a Giant Puppet making workshop. 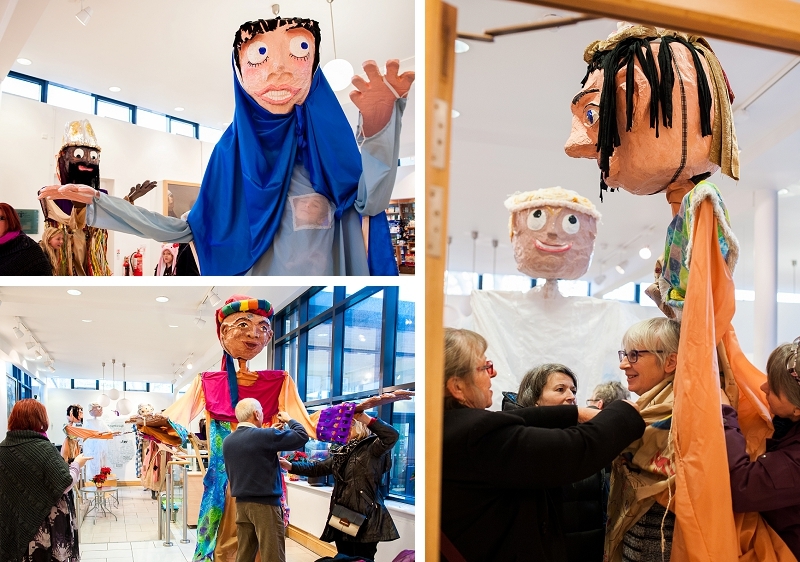 The workshop was held by the group ‘In Another Place’ who had lots of experience in creating and using Giant Puppets and had very generously agreed to show us how we create some ourselves! 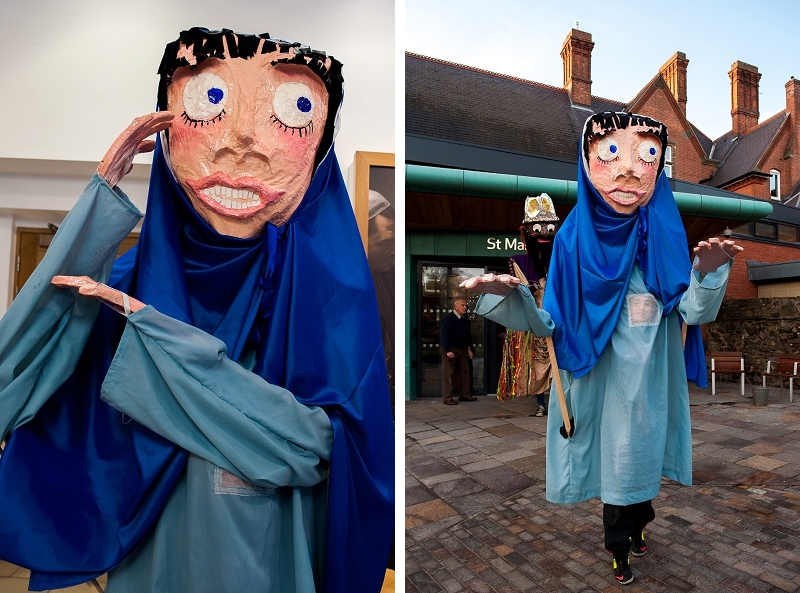 After a full day of getting very messy with papier-mache, getting to grips with the structure of the wooden frames and how to create the costumes we were exhausted but happy and filled with the enthusiasm of the ‘In Another Place’ team we felt confident we could create our own set of Giants! So the process began…. 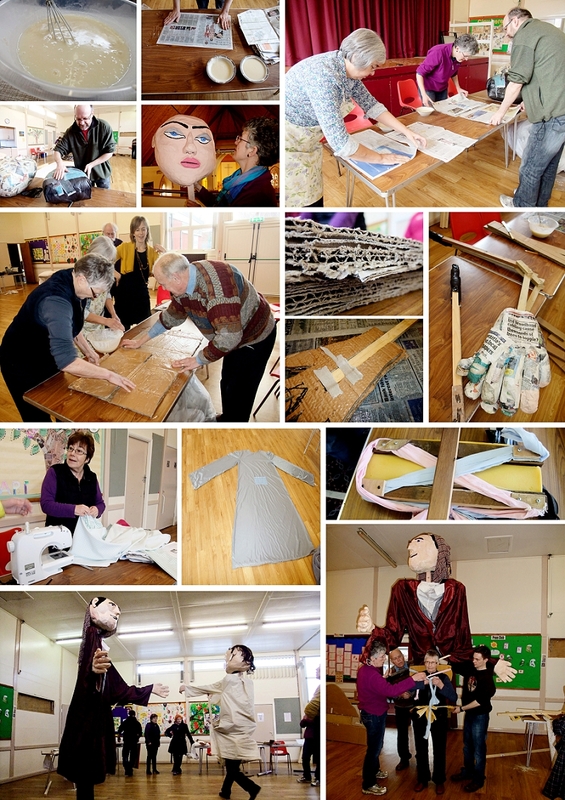 The next few months were a hive of activity as many different groups became involved in creating the puppets! 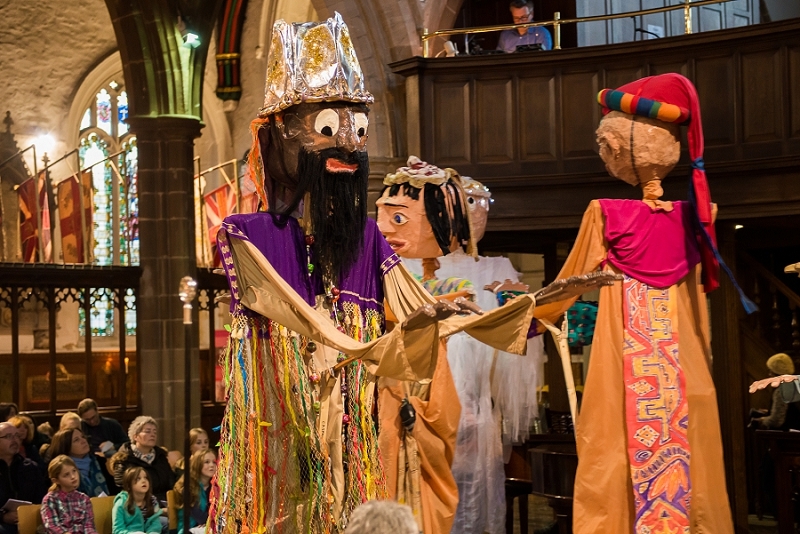 At Bishop Street we helped create two of the Wise Men, working on their heads, painting hands and creating robes and hats for them to wear. 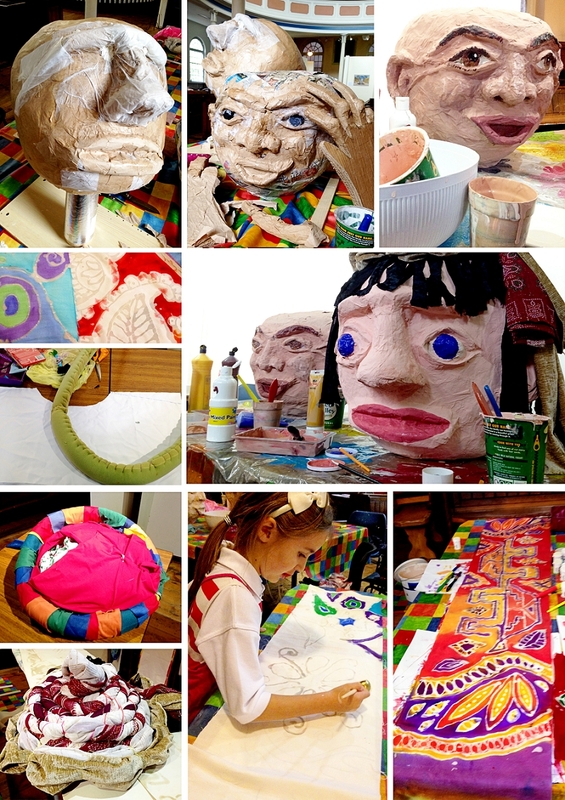 It was great to be able to work with lots of colours and textures. The children from the Bishop Street Sunday School also got involved and made the beautiful felt and ribbon cuffs for one of the wise men’s robes. Once they were made it was time for rehearsals to begin! 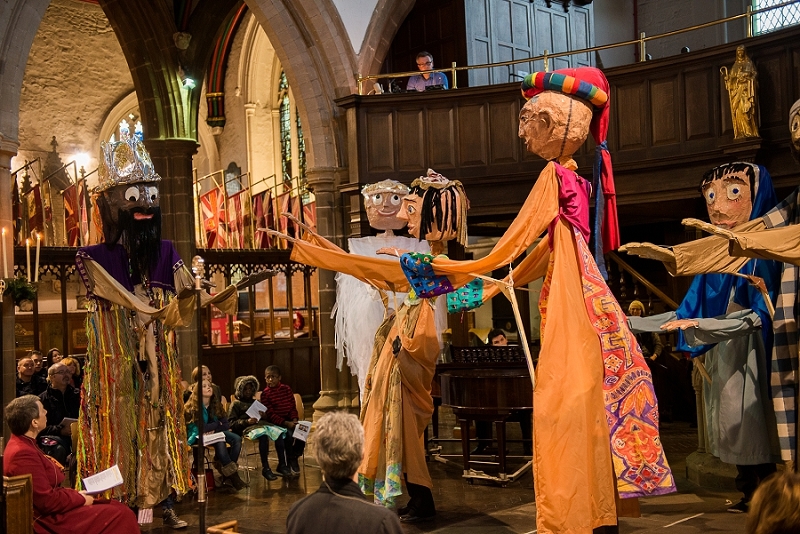 At this point we were having a few technical difficulties with the arms so as the first dress rehearsal took place the puppets were completely armless! 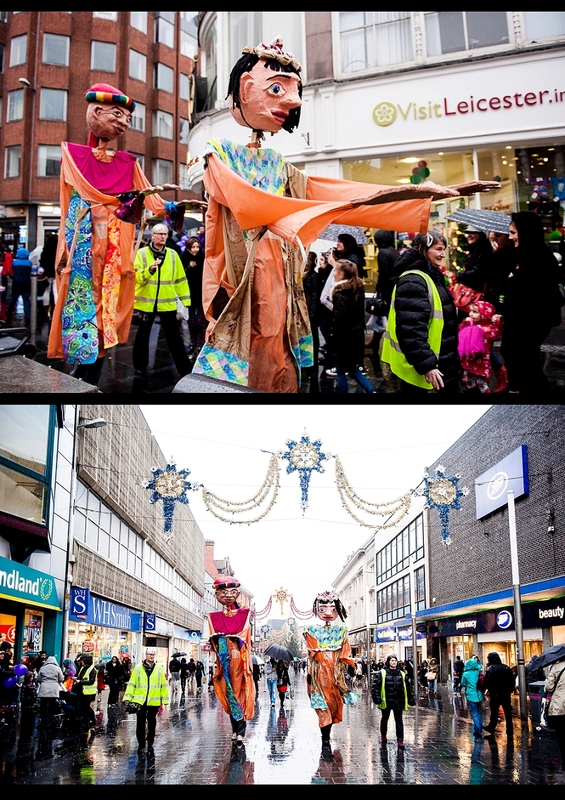 Suddenly the day of the first performance was upon us and despite the terrible weather the puppets took to the streets of Leicester City Center adding a bright splash of colour to the grey rainy day and putting smiles on peoples faces as the saw them! 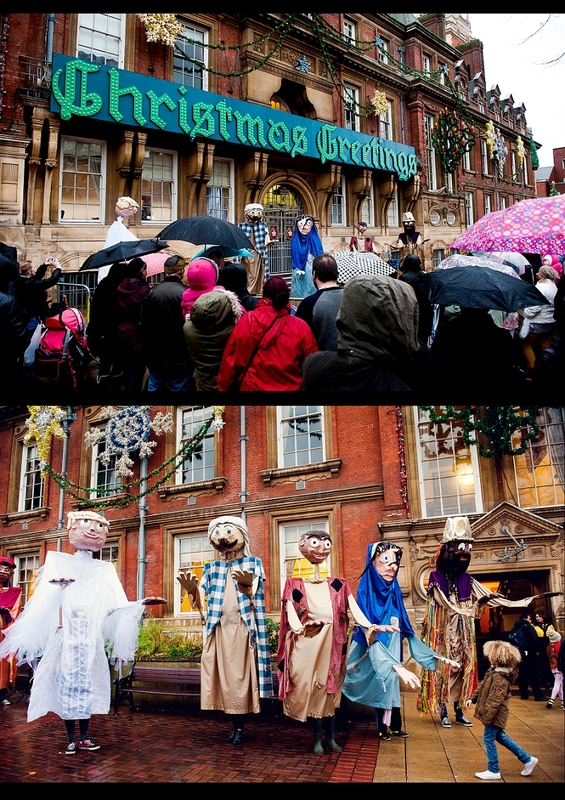 We had a great crowd of over 200 people who despite the rain put up hoods and brollies to watch as the Giants brought ‘In Another Place’s’ wonderful re-telling of the Nativity story to life and completely captivated their audience! 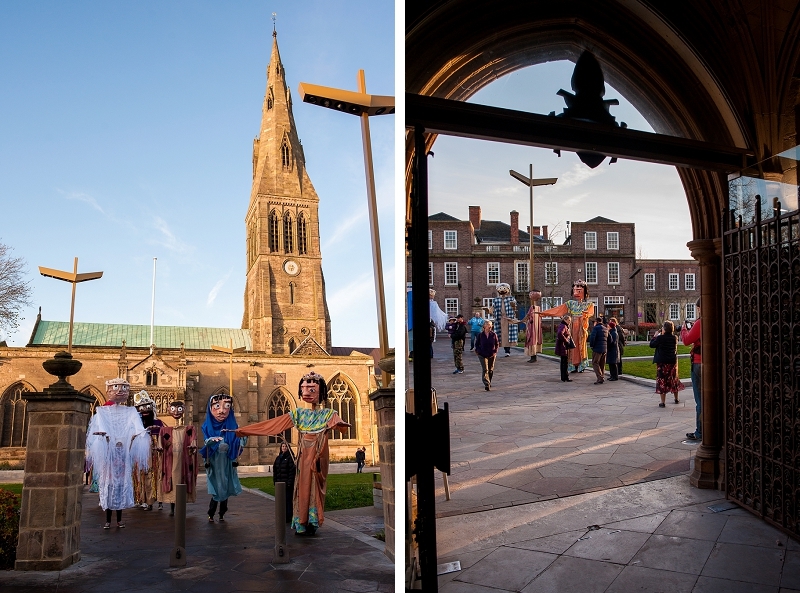 The three other performances at the Birstall Lights Switch On, Leicester Cathedral Christingle Service and the Nativity and Carols event at Hallam Fields were all equally well attended and successful! 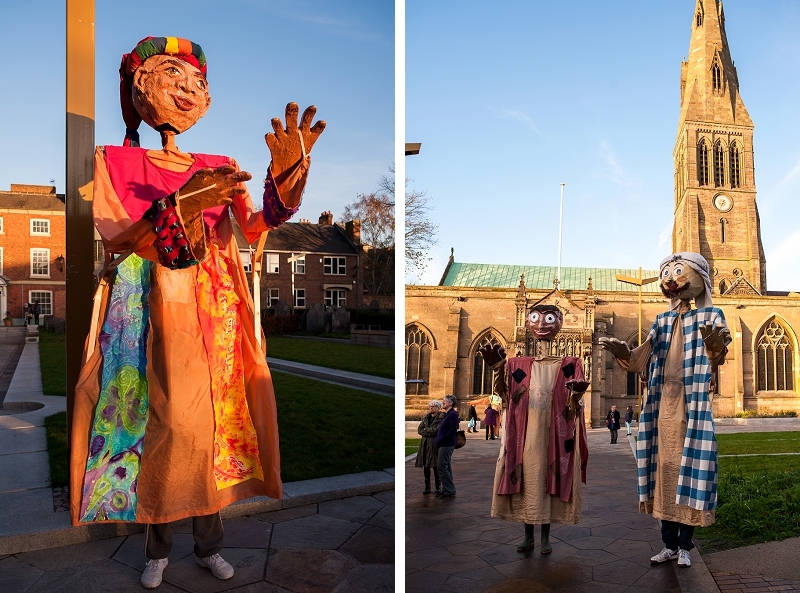 We would like to say a massive thank you to everyone who helped in the making of the puppets and to the puppeteers for all their hard work and commitment in making the Giants come to life!! 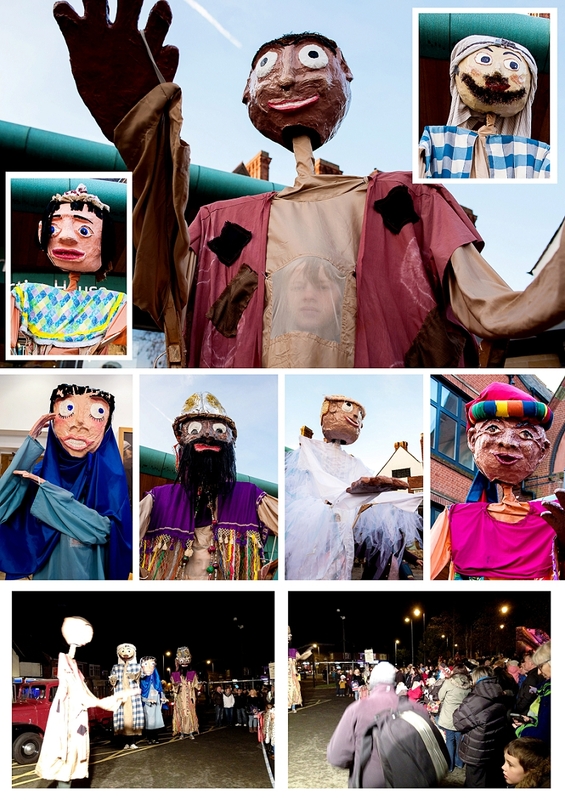 Categories: Giant Puppets | Permalink. 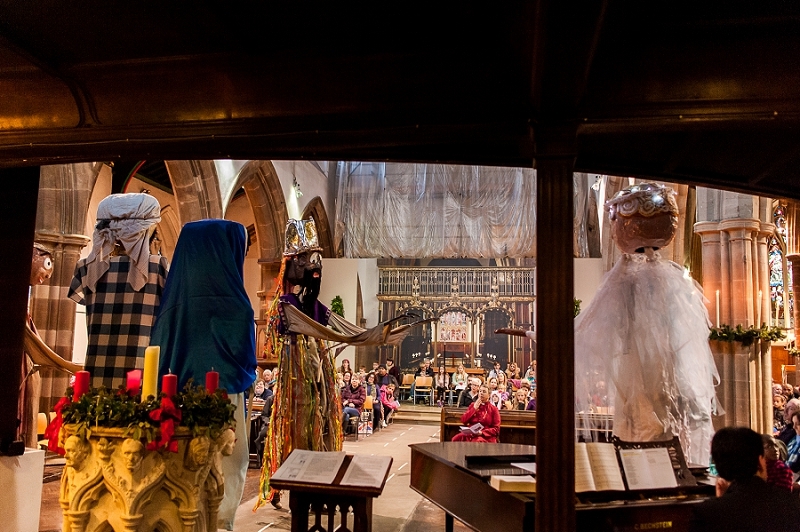 The puppets had a great time helping out at the Leicester Cathedral’s Christingle Service. 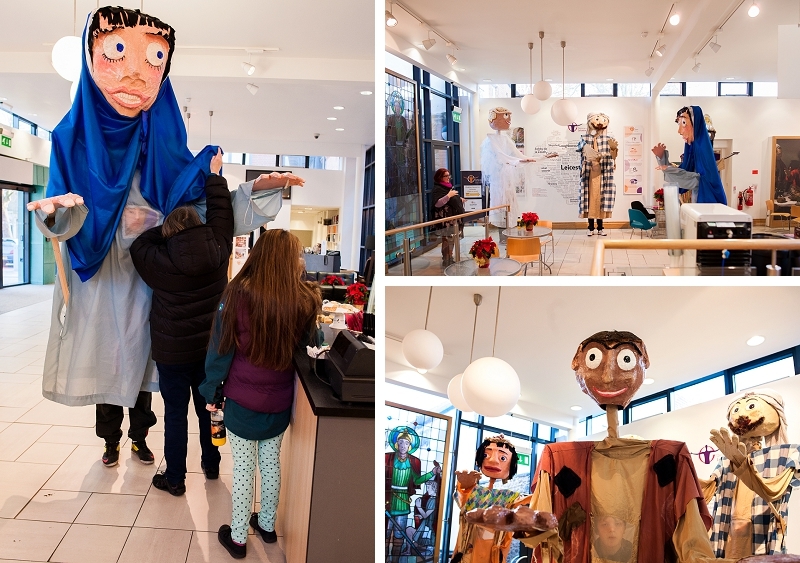 St Martin’s House was a perfect base to get the puppeteers into their costumes even if exiting through the doors was a little tricky for the giants! 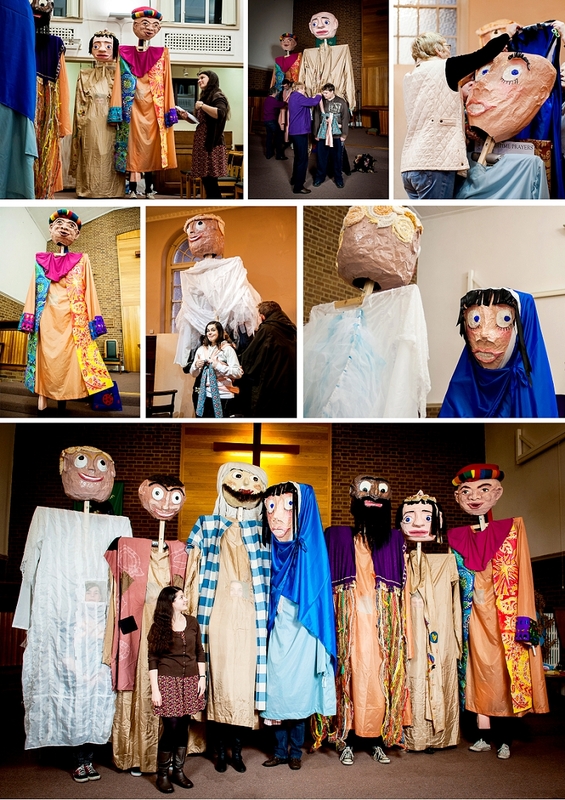 Before the service the puppets greeted people as they arrived! 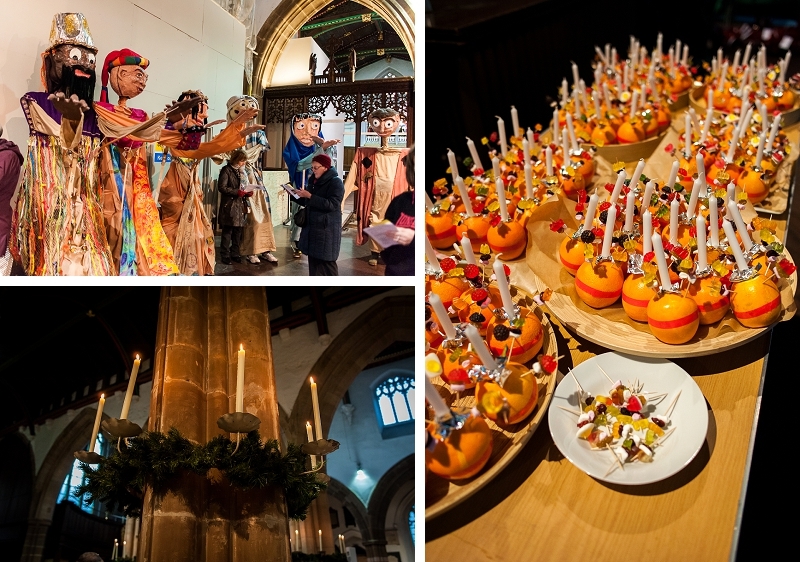 These beautiful Christingle candles had all been lovingly made ready to be distributed to those who came. 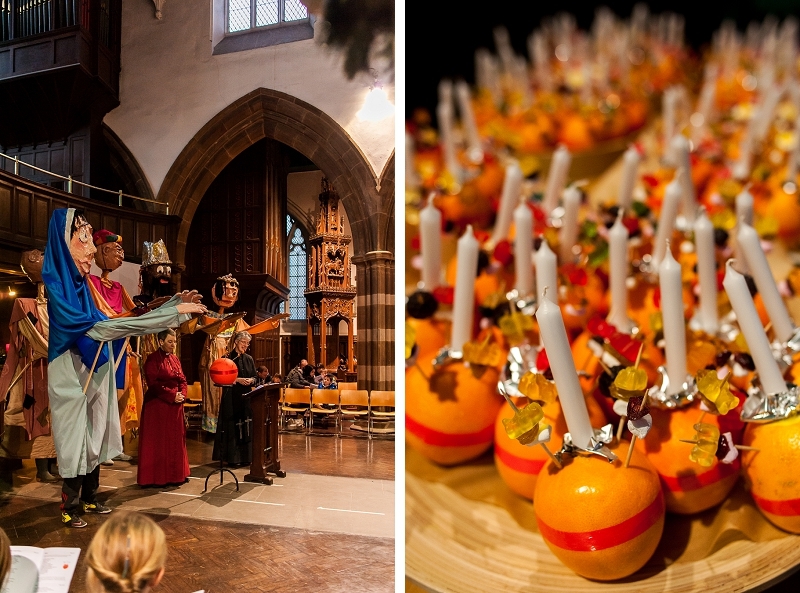 The puppets also helped carry in all the separate parts of a ‘Giant’ Christingle candle which was put together by Rosy Fairhurst from the Cathedral and Rachel Parkinson from Birstall Methodist Church who explained the significance of each part. The Giants taking a well deserved bow! 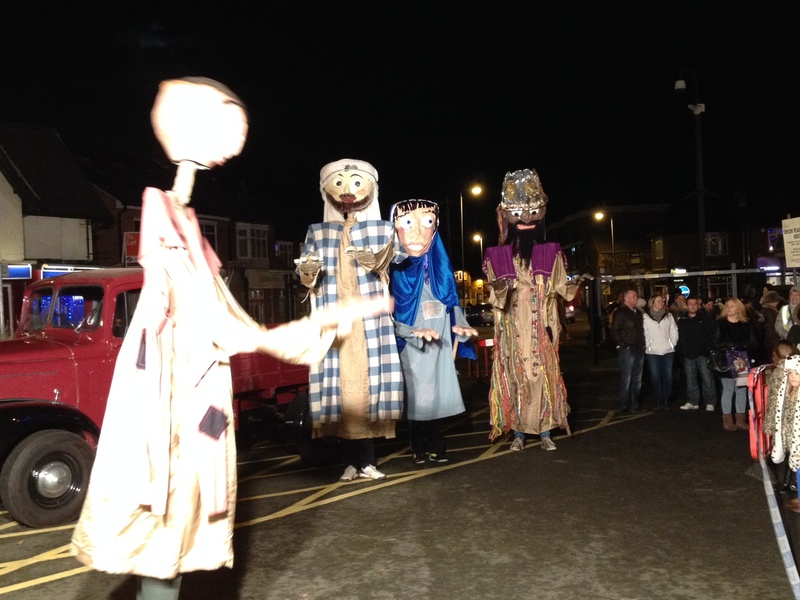 We had a great crowd to watch the puppets perform their Nativity Play at both the Birstall Lights Switch on and at the Nativity and Carols event at Hallam Fields. 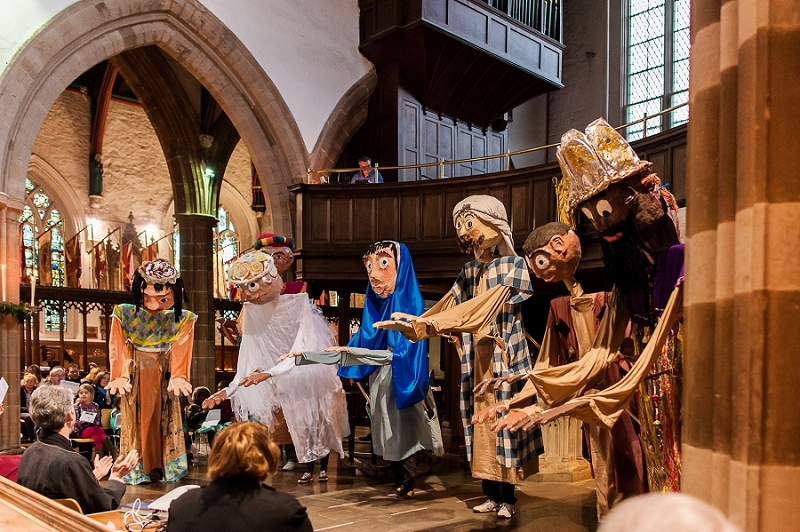 It has been fantastic that the puppets have been able to be seen by so many people in their first year, bringing the Nativity Story to life in a fresh and memorable way! 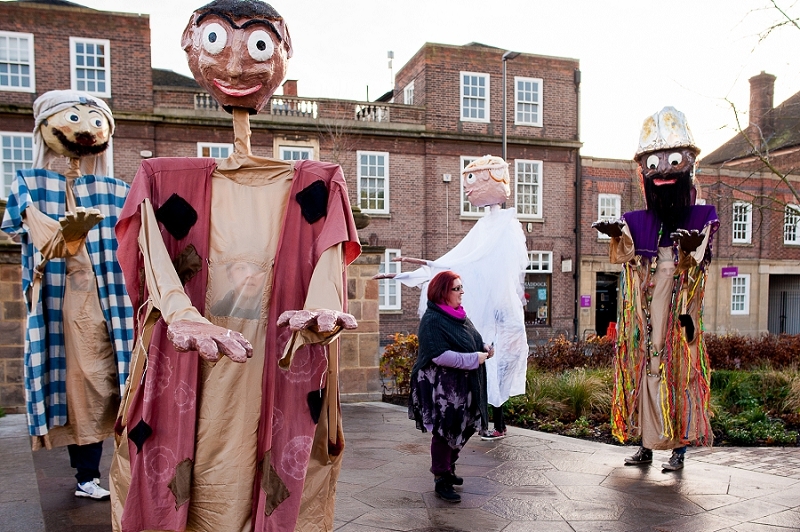 Our puppet team are preparing for two big events back to back. 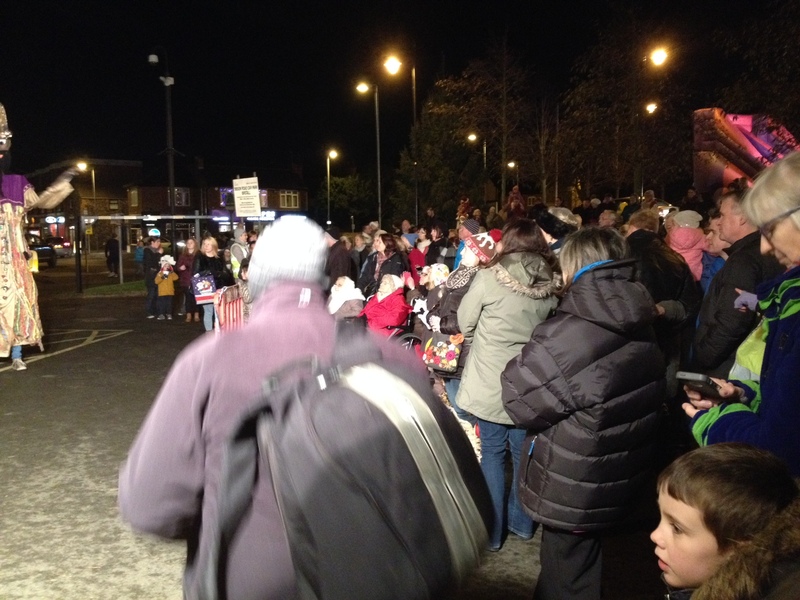 On Friday 5th December we’ll be at the Switching-on of the Christmas lights at Birstall on the Sibson Road car park at 5.30pm. 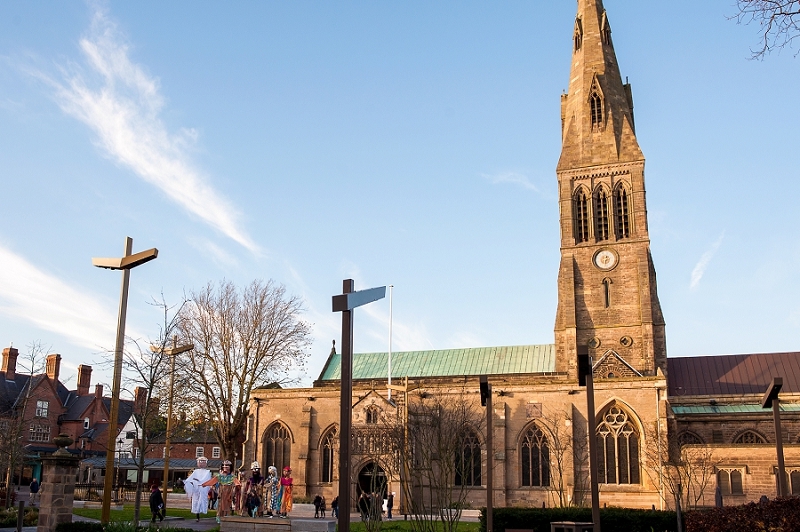 Then on Saturday we’re very excited to be taking part in the family Christingle service at Leicester Cathedral at 3pm. 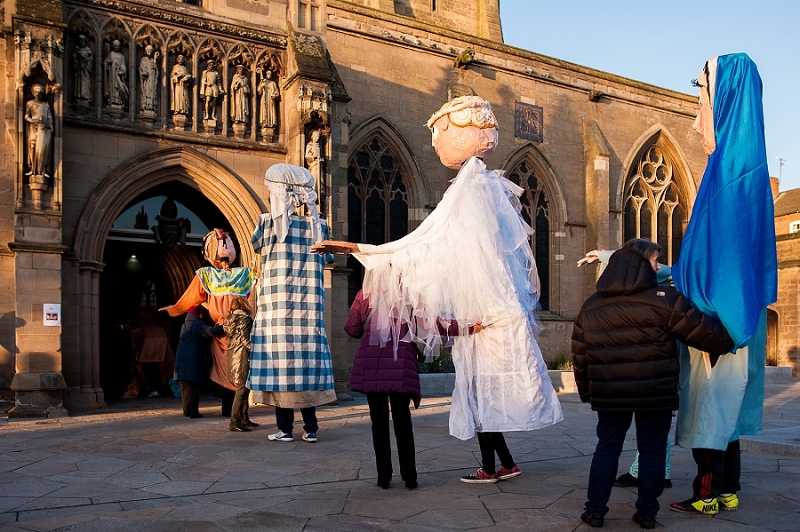 If you’ve not seen our great team of young puppeteers in action yet – have a look at our short video to see what’s in store.